A long staircase or a slide, which would you choose? – ¿¡ tjongolongo ?! After putting up the slide it was just a matter of waiting for the people to have some fun and jump and slide all the way down. Thefuntheory.com is an initiative by Volkswagen. They are looking at ways to make it more fun for people to change their behavior for the better. Tjongolongo, if they did things like this I’d sure be having some fun changing my behavior! Which would you choose? 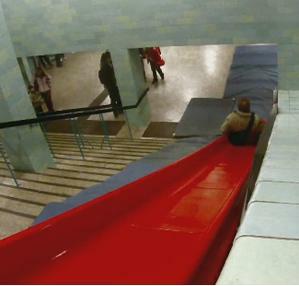 The escalator or the slide?